Historically, the western kendoka has had a tough time finding books and materials to study in his native language. It is only natural that most texts on the subject of kendo and kendo kata are published in the Japanese language. The Netherlands and Belgium could be considered a very small market for kendo-related books. Thus, the only kendo books in the dutch language that I am aware of are Louis Vitalis-sensei‘s book and the translation of Jeff Broderick’s book. It is with great pleasure that we announce the publication of a brand new, dutch kendo book. 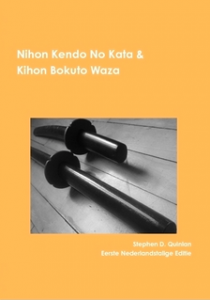 “Nihon Kendo no Kata & Kihon Bokuto Waza” is a translation of Stephen Quinlan-sensei‘s essay on both the traditional kendo kata and on the modern set of waza practices with bokuto. Thomas Sluyter translated the book into the dutch language, in cooperation with Quinlan-sensei. The book is available both in print and as a free ebook. The original, english version can be obtained here. The mindset of kendo instruction and the importance of the uchidachi-shidachi relationship. The seven tachi kata, are discussed in detail and annotated with pointers. The three kodachi kata, are discussed in detail and annotated with pointers. The nine kihon bokuto waza, are discussed in detail and annotated with pointers. The underlying principles (riai) of the kata: the techical, philosophical and religious backgrounds. As teachers at the Kingston Kendo Club in Canada, Stephen and Christina Quinlan have written many study materials for their students. One of their largest bodies of work is this particular book, “Nihon Kendo no Kata & Kihon Bokuto Waza“. The book combines literal, technical descriptions of each kata with deep backgrounds on the history, and the philosophy behind the kata. Many books by esteemed teachers were referenced to build this comprehensive body of knowledge. Thomas Sluyter is a relatively new student of kendo at Renshinjuku Kendo in Amstelveen, the Netherlands. As an avid reader of kendo books, he felt that this particular book should be read by as many Dutch kendoka as possible.